Welcome back for our Week 8 check-in on our Financial Peace Journey. Financial Peace University is a weekly course that takes place over the course of 9 weeks; if you’re interested in checking it out, you can go to his website www.DaveRamsey.com and search for nearby classes. We’re taking ours through our church. Buying a home is about the only debt the Dave Ramsey will tolerate (for a little while). He still doesn’t encourage it, but recognizes that most people don’t have the willpower and patience to pile up enough cash to buy a their first home outright. Remember to hate debt; don’t borrow more than you have to. Make sure the payment is not more than 25% of your monthly take-home pay. Get a fixed-rate 15 year mortgage. Put at least 10% down. We already own our home, so here’s where we stand with our mortgage. We weren’t married when we purchased, so technically the Mister bought the house. He was able to qualify for a 100% fixed-rate first-time buyers program with no PMI. That was great at the time because we didn’t have to bring any money to the table, but when we’ve looked re-financing to take advantage of lower rates, there isn’t enough equity involved to do so without bringing a few grand to the table. Fortunately, we’re not upside-down. Since we’re not unhappy here, and the payment isn’t killing us, the plan is to get the debt paid off and keep cash-flowing our renovation projects. When we get my business paid off in a few years, we can pile up money for an appropriate down payment on our next home (if not do the 100%-down plan). At that time, we’ll assess whether there enough is equity in this house to sell it. Luckily, our proximity to downtown Columbia and the University of South Carolina means that renting the house is an option as well. 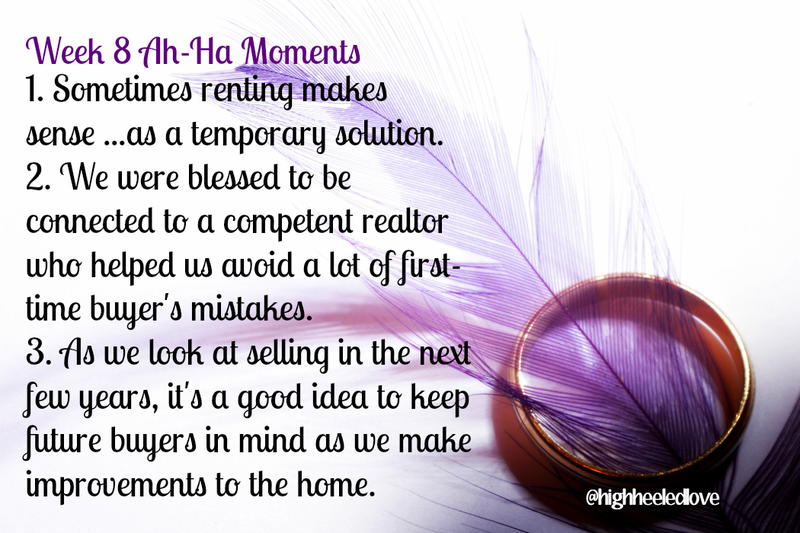 A significant portion of the session this week also focused on getting a home ready to sell, which was good food for thought for us. The Mister and I discussed how some of our improvements need to be with the idea of curb appeal in mind. It also brought back memories of shopping for this home. When we moved in, there was a lot of old carpet and bad wallpaper that had enough imagination to see past. What financial victories have you accomplished this week? Are you happy with your retirement savings? What could you do to increase or improve your situation? Want to catch up on our financial peace journey?